Let’s look at how to write white papers. Before we start writing, we need to perform three writing tasks. Identify our readers, define their needs, and clarify how we’ll solve this problem. Before you start writing, examine these tasks as they form the basis of your white papers. Consider them the foundation upon which your materials will be developed. Green Energy White Paper theme – ideal for environmental, health, and energy-related white papers. It sounds like a paradox, but the introduction is the best place to summarize your findings. Publications, such as newspapers, use headlines and paragraph summaries to hold the reader’s interest: white papers benefit from the same approach. Putting the conclusion at the end of your white paper make senses, but you need to be careful as this section is often overlooked by the reader, many of whom won’t read to the very end. To compensate for this, summarize your key points in the first chapter. This stimulates the reader’s curiosity and encourages them to turn the page… and move into the body of the document. Remember, if you don’t write a compelling introduction, it’s unlikely the reader will get past the first page. Find some angle that makes them want to read more. And then build upon this in each successive chapter. Think of your customers are prospective investors. And investors are a very discriminating audience. They judge technologies, products, and ideas based on objective information and the track record of those involved. They are hungry for real facts and dismiss unsubstantiated claims. Maintaining their attention involves building trust and offering facts that are interesting, relevant, and true. They look for trustworthy evidence to substantiate your claims. By providing this evidence, you not only save them time but also increase your credibility. Finding meaningful testimonials is well worth the effort. Avoid jargon, clichés and Three Letter Acronyms (TLAs). Product descriptions, written by developers, web designers, or marketing directors, often contain assumptions about the product understood only by their peers. Avoid this where possible. Don’t make the reader ‘work’ to understand your product. What platform is it designed for? Where language is it written in? After providing this preliminary information, get to the main issues. If you know that your readers are, for example, technology experts then don’t teach them the basics. They will just skip past these sections. Generalities and bland repetition drives such readers away. Instead, describe specific aspects that ring true with your audience. It’s one thing to claim your product solves a problem, but it’s more convincing to describe how it does this. Provide evidence that your solution is better than your rivals – and then substantiate this with, for example, benchmark tests or independent assessments. Use graphics, tables, and charts to help the reader understand your product. Graphics are ideal for illustrating the relationship between concepts, technologies, and systems. Tables help present data in a format that’s easier to consume. Matrices are very useful if you want to break out roles and responsibilities. White space gives the text more breathing room. Remember that readers will get tired after reading several pages; use graphics, tables and charts as an alternative to the text. 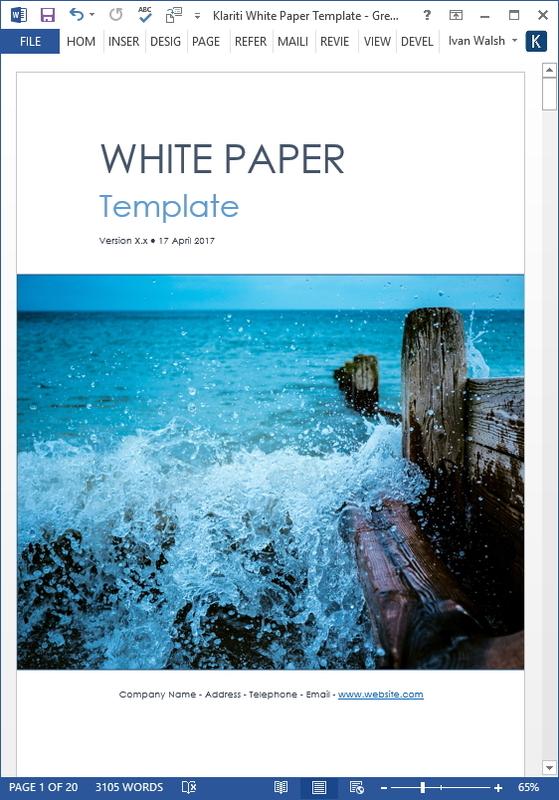 How you format your white paper plays a key role in getting others to read it and follow your call to action. Though the IT industry is international, for many readers English is a second language. Make sure to avoid using lengthy paragraphs, complex sentences, and buzzwords. Instead, use simple, plain English. Such writing carries real power – the power to convince and convert. If the best ingredient for an effective white paper is a terrific solution to a technical problem, then the next best ingredient is great writing. The secret to writing successful white papers is to write it from the angle of your reader. Instead of focusing on your product or service, develop ‘themes’ that tap into your prospective customer’s underlying needs. Once you’ve identified these, use compelling arguments that appeal to their head (logic and rational) and their heart (emotional and impulsive). By using this two-pronged approach your white papers will have more impact and encourage the reader to follow your ‘call to action’. 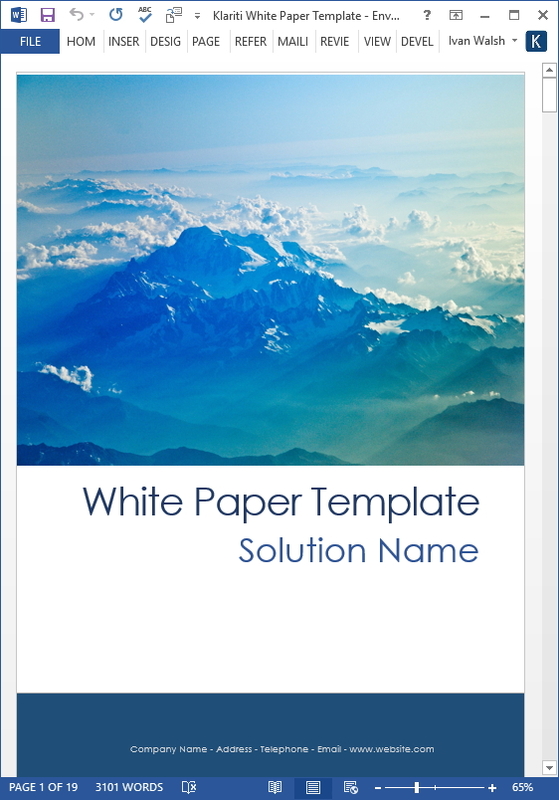 Improve the quality of your white papers with 15 royalty-free MS Word White Paper templates. Instant download. Works in all versions of MS Word for Office and MS Word for Apple. Each of these templates is easy to modify. You can edit, update, and remove any text, images or charts in the files depending on your preferences.